Collegiate esports, worth investing in? Not only sports and esports are similar in terms of playing but team compositions are similar as well. Sports have members in the teams such as “managers, coaches, starters, reserve players, and referees” according to MatPat and the same roles apply for esports, teams have managers, and coaches, starters are considered the main roster for a team, reserve players are the substitute players in a team, and referees are the administrators of a tournament. It is also commonly mistaken that video games and esports are the same thing; Funk stated “While all eSports are video games, not all video gaming should be classified as sport. Video games must have structure (e.g., standard rules), organization (e.g., rule adherence), and competition (e.g., clear winners and losers) to be considered sport.” For example Batman: Arkham City has fighting in it, however it’s not an esport game, this is because it is essentially a story game that do not have competition against other players. Comparing that to a game like Smite, this game involved strategy and competition against other players, and for its esports it has rules and standards like in their SPL tournaments. An important aspect of collegiate esports is the NCAA. NCAA has not formally recognized esports as a sport, however it is in the best interest that they do. There are several colleges that support varsity esports such as Illinois College, Georgia State University, Indiana Tech and a handful of others. NCAA should include esports because “The eSports model will also easily fit into the NCAA structure of Division 1, Division 2 and Division 3”. Each university can provide different games and structure different teams based on the athlete’s ability level” There are skill level gaps among esport teams, and already having a system like the NCAA can help secure esports in colleges. Like Hockey, Soccer and Football they all fall under sports, the same can be applied for esports, SMITE, League of Legends and Dota 2 they all can be applied under esports, it is not limited to just one game. From running tournaments at AVGL there is a huge amount of following for collegiate esports, our Fall 2017 League of Legends tournament had 107 teams competing from US or Canada, that’s 535 players. And when including other game tournaments that we ran for Fall 2017, we had over 1,200 players. That is a huge following for collegiate esports, and only a handful of the teams were actually varsity teams. But the problem is, the conversation of having esports in the NCAA has come up several times and it has not been implemented yet; this makes me believe that esports wont enter the NCAA. This problem makes it very hard for colleges to enter the esports scene because there is no structure other than the tournaments hosters in place. There are several perks of having varsity esports teams. 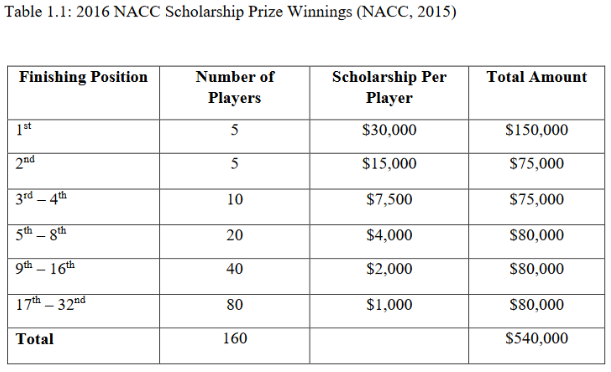 For students or players, there usually is a nice scholarship money. For example “University of Pikeville (KY) 2014 Offers full ride scholarships available ($23,000/year tuition; $14,000 room and board)”(Jenny). Tournaments for collegiate esports have a huge prize pool payout. The chart above from the article Campus Knowledge of eSports shows the prize pool of the North American Collegiate Championship hosted by Riot Games for their game League of Legends. This is a huge prize pool for college students, and in most cases that would cover the semester or the year’s worth tuition. But college students enter representing their school, all the money goes towards the player because the school does not have any involvement; the students are entering as an unsanctioned team. Colleges could have sanctioned their teams so the money is directly used for college tuitions and other payments.Even if colleges have sanctioned teams, esports has too many games that colleges simply would not be able to sanction all the games. To put this statistics into perspective in 2013 “NBA’s Miami Heat vs San Antonio Spurs broadcasted on a public network ABC and drew 26.3 million viewers; while that same year League of Legends world final was streamed on Twitch.tv that drew 32 million viewers.” And League of Legends competitive scene has only been released 3 years prior to that, this shows that esports can pull a huge amount of viewers. Colleges that have varsity esport teams can live stream their matches and I believe majority of the gamers on campus will tune in for that. And the reason that esports pulls a lot of viewership is because esports is not bound to any location, other than internet of course which is global. Twitch has an amazing program called Twitch Partners, this enables Twitch streamers to run ads on their live stream, and even have paid subscribers. All this money will go directly to the college after Twitch takes their cut, but that is still a lot of money that the school can make. Even though Twitch is an excellent outlet to make some profits, it also need a lot of staff members to moderate chat and make sure broadcast is run smoothly. Sponsorships are a great way for sport teams to make money, we have even seen Coca Cola ads during the Olympics. In esports sponsorships are much easier to obtain, they have fairly low requirements, which almost all colleges meet. Just to show how easy it is RMU esports has over 6000 followers on Twitter and on their Twitch they have around 300 followers; sponsors love to support collegiate esports. RMU has the following sponsors, Steel Series, DxRacer, iBuyPower, Discord, Twitch and almost 10 more sponsors, with all those sponsors it is fairly easy for colleges to set up an esports division. All these benefits are great for colleges however there are a lot problems that makes collegiate esports difficult to invest in. Esports have several games in it and it varies even in genre of the game, so colleges have a variety of games to invest in. The most common game is League of Legends, that is primarily because of the large player pool for the game and the large prize pool for their tournaments, but if a college wants to include other games how would each teams for esports be treated. For example Smite has a much smaller prize pool for collegiate tournaments compared to League of Legends, so if a college is to include a Smite team the profit would not be as high as League of Legends. So how would they treat the players for each team, would one team get less scholarship money? This causes some serious problems because a Smite team could be putting in the same amount of work as a League of Legends team but the school can not make same amount of profit from each team. That tells me expanding their teams would be very difficult, and more likely would stick to the game that gives them the most profit. The collegiate esports scene would suffer due to lack of diversity in games. Collegiate Varsity Esport teams are not highly skilled. AVGL hosted a League of Legends tournament for the Fall 2017 semester. This tournament had over a hundred teams and from the results of the tournaments, I am able to state that varsity teams are not nearly high skilled as they should be. It is not that the varsity team are not equipped with proper equipment to play at the highest skillset, it is that coaches or the players are just not doing their roles correctly. Coaches are an important aspect of sports and esports, they are the ones to help the player get better, however esports coaches have a lot of work to put in; this is because for esport titles or moba games, the meta changes. Meta is something we call as a ‘standard’ things to do this version of the game, so our coaches have to stay on top of it. Along with that, doing the math for building items in games and assessing player damage etc… it is a very big aspect of these types of games. So that could very well be the problem for the teams, coaches not being able to coach properly just because it is very time consuming. They are students first, and athletes second. Most varsity programs offer some type of scholarship so how does teams work for stuff like this. Most teams are compromised to fill the basic minimum slot, for example five main players and usually three subs. Eight player rosters, but in the gaming industry roster changes are very common. School and coaches should be willing to kick members from their teams if they are not performing well. This is a tough choice for gaming teams because we rely on team synergy, because this game requires heavy communication it’s hard to toss a player in and expect them to understand how each of their teammates play and communicate at their level. So team compositions are a huge factor for these varsity teams. I think the best solution is to be very picky about their players, hold a much more difficult tryouts and create a higher incentive for students to enter the team. This is again a problem for colleges to do because of the rigorous tryouts there is no ‘prerequisites’ that can be obtained to determine top players. Focusing a bit more on team synergy, team communication is very important in esports; they need to be constantly talking and give good and relative information. With this information is up to the team captain to make calls on what to do in game. This is something that is very difficult to do, hesitating could be a serious problem. So who gets the team captain role? This is very difficult because as individual players they might be decent players but they need to be able to keep constant communication to make proper plays in game. This is different from sports because usually the calls for a play are before a game, but in esports its during it. A captain needs to be capable of making the right calls during the game, something a coach can not help with (Usually not allowed in any competitive esports). The amount of sacrifice players need to makes it really difficult for colleges to consider investing in because they are students. I conducted a survey and asked college gamers “how does collegiate varsity esports team compare skill wise to just gaming clubs. Pretty much is there a skill gap?” The best response I got regarding this is from Victor, he states “I don’t think there is much correlation between varsity and skill based on our leagues. But I definitely think that will change over the next 2 years as the varsity programs get more organized. Right now, the teams are all so new that they are working on hiring coaches and recruiting players and it will take time. Our LoL league had University of Houston (club) beating out varsity teams to reach the Grand Final. However, Columbia College (varsity) was extremely good and beat Houston handedly. They have shown what a year or two and a strong coaching staff can build and there will be more of that to come. A team with a full time coach and 2 analyst are going to beat out a team without the resources in the long run.” I do not believe that things will change in 2 years, more likely 6 years. Students are usually at the school for four years, if nearly 2 years of coaching was not enough to beat a normal college team, how much time do they have to improve the teams each year? I do not think four years is enough for a team to improve so much that they can beat regular players. Because most students are at the school for 4 years, its not worth investing in the players because it is difficult to help a player improve drastically in that short amount of time. Football, soccer, baseball they have not had massive changes over the years, however in the esports industry especially MOBA games there is always an update for the game. The updates could be weekly, bi-weekly or even monthly, but there are always changes. This could be a downside for players who want to commit several hours for the team to be up to date with game and improve on new strategies, however colleges can not forget that they are students first. Overall the esports industry is great, it has been growing and have had a lot of success. The collegiate scene on the other hand does not have the same success, there are too many problems starting with NCAA, skill gap, and maintenance that will cause colleges a hard time to start up. Funk, Daniel. “ESport Management: Embracing ESport Education and Research Opportunities.” Sport Management Review, Elsevier, 23 July 2017, www.sciencedirect.com/science/article/pii/S1441352317300670. Kane, Daniel. “May 11, 2017 Recognizing ESports as a Sport.” Https://Www.researchgate.net/Profile/Daniel_Kane13/Publication/317929457_Recognizing_ESports_as_a_Sport/Links/597f4db5a6fdcc1a9acd7fe1/Recognizing-ESports-as-a-Sport.pdf, 11 May 2017, www.researchgate.net/publication/317929457_Recognizing_ESports_as_a_Sport. Sugishita, Kenny. “Campus Knowledge of Esports.” Scholarcommons, Scholarcommons., 14 Dec. 2015, scholarcommons.sc.edu/cgi/viewcontent.cgi?article=4292&context=etd. Sunny, Jithin Is there skill gap between varsity and casual esports players?. https://imgur.com/a/tWIZa . Accessed 6 December 2017. Core Value I Understand that writing is a practice which involves a multi-stage, recursive and social process. Core value I is about showing that we have spent time on writing. To show that we went back to our writing and improved it anyway we can. I have learned that first draft is not what you submit last, there is a lot to improve on in a single paper. I have shown this by rewriting my Causal and Rebuttal Arguments. For example in my causal argument I talked about the value of coaches on teams, this comparison came out as coaches in esports having more burden than sport coaches, which was not my intention. Revising this showed clarification in my writing and communicated the proper meaning I wanted for my argument in sports vs esports. Core value II means to use multiple sources together to essentially show counterpoints or supporting points to other sources to help create a dialogue in our writing. I found myself not doing this, however I found a really good statement that helped me write a paragraph that created a conversation for a counterpoint. In my Rebuttal Argument I used other sources I found to argue the point of getting hurt in esports. I was able to use another article to show that people can get hurt in sports as well, and just like how there are protective gear for sports, there are protective gears for esports players to avoid getting injured. I synthesized these articles to show a conversation of esports and sports are similar in terms of injuries can occur in both. Core Value II shows that I understand who I am writing to. Also to show that I understood my sources properly, and write correctly regarding its topic. I found this to be fairly easy, I was able to identify the audience and its purpose from reading the thesis, however when I was writing it I found it difficult to show who my audience and is. In my Safer Saws I showed up understand of the text, and what purpose it served for the readers. However when I did reread some of my sources I did not understand if they were for or against, it was after rereading it, and understood the author’s perspective that I was able to truly explain what the author meant. Core Value IV is stating that all the sources we used was incorporated to our writing properly. That I did not give false meaning for a source. I found this to be really difficult before I did my Annotated Bibliography because the information for my essays were scrambled around, and really did not have any organization. In my annotated bibliography I was able to give a summary of the articles by pointing out the important statements, and show how I used it in my paper. This helped my organize statements to support my ideas, or show counterpoints to my ideas. Showing how I used it helped me get the proper interpretation of my ideas in my writing. Core value V shows that I have credited the proper authors, and used the sources properly. Doing this properly shows where we got our ideas from, and being ethical by not stealing their work. This was the easiest because I showed my work cited pages in my annotated bibliography, visual Rhetoric Rewrite, essentially anything that pulled an idea from somewhere else. Anyone can also be a professional gamer. A good internet connection and decent specs on your computer can make you the next big name in gaming, if there has ever been one. These pro gamers spend nearly 12 hours a day training for the next competition. But can’t that be said about athletes as well. Anyone can also be a professional athelete, they just need some training and learn some techniques. A person who likes football can pick up a football and start throwing and practicing. To be a pro gamer it is much harder, for example in MOBA games there are constant changes to the game where players have to learn the new meta and strategies of the game. Training in eSports is rather detrimental to your health. Aches and pains in your hands from tapping away at your keyboard could have prolonged effects on your health, and looking at a bright screen for too long can hurt your eyes. Yes, if you were practicing with a teammate for football and get hit in the head too hard you can get a concussion, and that too could have long term effects on your health. But new protective gear could one day erase these injuries. For eSports, however, glasses and gloves would only dull the pain for so long. Like Gabianelli anyone can get hurt. He makes a remark about how new protective gear help avoid this, but that is also true for video games. We have features with monitors where the lightning is adjusted so it doesnt strain your eye. And with new keyboards with wrist support and other neat features these problems are resolved, you just need the proper equipment for esports; similar in the way you need proper equipment in sports. In a similar way, while eSports has “sports” in the name, it is the furthest thing from any sport we watch or play today. Hocket is not like foot; but we consider both of them sports, just because we changed how we watch and play, does not mean its not sports. There are several traditional sports like hockey, football, soccer etc… And there are several esport games like League of Legends, Smite, Overwatch. I’m sure we all watch sports and esports the same way, there are bars now that show esports instead of sports, just like a typical bar. People gather around to watch sports; eating food and getting really excited. We do this in esports too, we gather with our friends and watch esports and whenever something cool happens we get really excited. We may not be playing it exactly the same but we are watching it the same for sure. Formoso, Anthony Gabianelli & Thomas, and The Montclarion. “Point/Counterpoint: Are ESports ‘Real’ Sports?” USA Today, Gannett Satellite Information Network, 16 Apr. 2017, college.usatoday.com/2017/04/16/pointcounterpoint-are-esports-real-sports/. Esports is commonly mistaken with having the argument its not a real sport because it does not involve physical activities. Instead it should be focused on the the type of training it takes to get to their level. 11B: This amputee is saying he accidentally got injured. 11C: Proposal, seems like he wants safety to be more accessible. 11D: This makes complete sense logically, why wouldn’t someone who lost their fingers want better safety technology for their tools. 3B: There are ways to avoid getting injured with system like SawStop, but we are not having this as a mandatory quite yet. 3C: Proposal, they are trying to get safety to be a higher priority as it 15 years have gone by trying to push this. 3D: This is persuasive to push saw safety, 15 years is a long time and we still have not come to a resolve. With technology like SawStop theres a question asked why have there been no improvement on regulation for safety yet. 6C: Fact, there are several people being injured and lawsuit brought to the manufacturers.